Jean Philippe Rameau's Platée is a comic opera in which the Gods of Olympus play a part. Lully had banned all comical characters from the opera, but the musical comedy genre survived and Rameau's contribution to light entertainment with Platée was a success, originally a ballet bouffon devised as a great spectacle with ballet, magnificent costumes and brilliant music (1745, Versailles) . The last survives in this Opéra National production, which we saw in Paris, but I was not sure at first that the TV version works for home viewing. It is "anti-spectacular", set during the first half mostly in what looks like a job-lot of redundant old theatre or cinema seats which strait-jacket the performers, who have to run and climb along the aisles and over the rows, inebriated in homage to Bacchus a lot of the time and denying any illusion or visual beauty as they frame the individual singers in close up for their solos. The overture is great fun as staged, but everyone is required to ham it up incessantly and the jokes wear thin, detracting from the effect of the singing, which is acceptable to good. Paul Agnew is the eponymous lonely lady frog delusionally in love with the god Jupiter who isn't interested; he sings beautifully, pathetic in his incomprehension, furious and vengeful when he realises at the end that he has fallen for an elaborate practical joke culminating in mock marriage. One cannot quickly become engaged with the story line, and the first Act felt very long. It was made harder because the presentation is not good. There are the usual multilingual subtitles, but it takes some effort to determine who is singing when, because the track listing gives the first French phrases to be sung, but does not identify who will sing them; the synopsis helps you to work it out. But things improve with Acts 3 & 4; the set opens out, the 'swamp' aquires some greenery and reeds and there are some truly spectacular scenes musically, a long one for Paul Agnew (Platée) first, soon a show stopping, scene stealing one for Mireille Delunsch (La Folie) and gradually the dances and Laura Scozzi's subtle choreography begins to make their mark, as does the wealth of invention in Rameau's inexhaustible collections of dances, which are integral to the whole. Marc Minkowski conducts his original instruments orchestra with vigour and extravagant gesture, but the players look impassive and the thought escapes early on that he is playing to the camera? Later we find that he is drawn into the action, La Folie menaces him and puts herself at risk of falling into the orchestra pit; a Kermit-like non-singing frog descends from a box and causes mayhem in the orchestra, eventually taking the baton and a bow! It all gets increasingly crazy, with growing physicality in the choreography and a mounting atmosphere of cruelty as the 'swamp-nymph' gets ridiculed mercillessly by 'the Gods'. Plenty of political allegory for the mid-18th C for those so minded to interpret it. By the end we were glad that we had watched it through, with steadily mounting interest and enjoyment in the second half as we gradually began to appreciate what the production team was on about. This is one for Rameau enthusiasts who are unfazed by gross anachronism that tends to distance the music, which is notable for its inventive orchestration. The publicity material asserts that "it carries a style reminiscent of Rocky Horror, while still providing a perfect vehicle for the operatic talents of its stars". That must be for individual purchasers to decide and I would not like to pre-empt critical reactions to this DVD, which I anticipate will be varied. 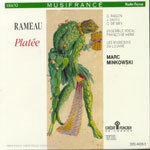 There have been four commercial recordings of Platée before this DVD, including Mark Minkowski's version from 1990 (Erato Musifrance: B000009IU9), with Gilles Ragon "breathing life into a role that is both technically demanding and elusive in character - - Ragon nicely captures her wonderment and curiosity when Jupiter descends in a cloud disguised first as a donkey and then as an owl - - A satisfying issue." (The Gramophone). There may be some who will prefer this CD version, freeing themselves to imagine the action in their minds whilst following the libretto, rather than submitting to the shock of Pelly's vision of an environment in which Paul Agnew, against the odds, succeeds in enlisting our sympathy for 'her' gullibility as the victim of the cruel practical jokes with which the Gods amuse themselves? Also includes 'The Triumph of Love' - 60 minute documentary on the background of the production, including interviews with Robert Carsen, William Christie, Barbara Bonney, Paul Agnew and Laurent Naouri. Also starring Paul Agnew (pleased to be a man again, as he explains in the film) this great last opera of Rameau was not mounted during his lifetime nor until modern times. It languished unseen for more than 200 years before resurfacing at the Biblioteque Nationale in Paris and the world has now woken up to its beauties and importance (a current production at Lyons, also with Paul Agnew as Abaris, is reviewed on Forum Opera, where you can see images of the relatively traditional costuming). Les Boréades or The Triumph of Love is at once simple and complex. The story is about the emancipation of a woman who defies all class convention to remain true to the man she loves unswervingly; eventually she is found to be eligible when the truth of his birth is revealed. William Christie firmly supports the radical, modernistic staging, with odd, idiosyncratic dancing, as being truer to Rameau for modern audiences than could be any attempt at historical reconstruction. One oddity is that we never see the musicians of Les Arts Florissants, and have to wait for even a glimpse of William Christie until he takes his bow at the end, and gives his views about Rameau and the collaboration with Robert Carsen in the film. Agnew is ideally cast and takes us through all the moods of hope, despair and eventual delight; he tells us about the special requirements for the French haute contre style of which he is a master. Barbara Bonney as Queen Alphise has to act a lot, sing dramatically at a tessitura which she tells us is not quite right for her light soprano, and to content herself with just two arias as against Agnew's seven! Laurent Naouri is the villain who finds himself impotent and furious at his eventual appearance in Act 5. Anne-Maria Panzarella sounds out of best voice in her small part as Alphise's companion. There are many delicious dances, showing off Rameau's skill as an orchestrator and offering enough interest to satisfy lover of modern dance who are not too sure about baroque opera. Filmed at the Palais Garnier in Paris (the one with the joyous Chagall roof) there are many wonderful and memorable stage pictures which look fine on the small screen. Flowers taken through the seasons, multiple functioned umbrellas - a fund of inventiveness which accords well with the innovative music and is better seen than described. I rate this DVD of Les Boréades very highly and, having seen also the documentary, am eager to watch it again. The documentary film is however disappointing. There are essential nuggets of information and wisdom, and it certainly clarifies aspects that are likely to pass you by, but the snatches of interview overlap repetitively and don't always quite fit with the overlong excerpts from the actual performance (this time lacking their subtitles) and the whole shows signs of haste and perfunctory editing. It is played in three acts, though the booklet listing separates the items into five acts, and does not provide the track numbers, which would greatly help. Notwithstanding these few caveats, an important DVD of a great opera which ought not to have had to wait so long for rediscovery.